The School Loop gradebook is optimized to support traditional, point-based or percentage-based grading. This article offers some helpful suggestions in regards to the way some of our teachers are using our system to establish a mastery-based or standards-based grading system. Make all of your assignments worth 4 points and assign each to the appropriate Standard category. Score your assignments using 1 through 4 as you would with a 4-point rubric with 1 being the lowest and 4 being the highest. Alternatively, you could use custom codes. See the section at the bottom of this page for more details. Here is an example of what the resulting progress report will look like once you have published your grades. Assignments can be sorted by Standard by clicking the Assessment label at the top of the first column. Your custom message appears under Comment. This message can be an explanation of how to read the progress report. Even though School Loop's gradebook can only function using a points-based system, you can further outline a standards-based system by using custom codes to represent the point value of the grades you award for assignments. 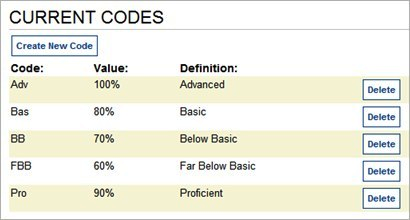 Assuming that you will be using a 5-point system, the following custom codes will allow you to award standards-based "grades". Set the value for each code in 5-point increments as desired. While the system is still calculating grades based on points, you can now enter scores such as Adv or Basic rather than 5 or 4. A legend for your custom codes will be included in the progress reports for students and parents. To further enhance the mastery style of grading, we offer a couple of different ways to present your published progress reports to students and parents. See our article on Mastery-Based Progress reports.